David Robinson reflects on our changing reading behaviours as he reads William Boyd’s latest novel. Twenty years ago, at a New York party hosted by David Bowie, William Boyd launched his monograph Nat Tate: An American Artist 1928-60 about the abstract expressionist who destroyed 99 per cent of his work before committing suicide by jumping off the Staten Island ferry. The book appeared with a glowing tribute on the back jacket by Gore Vidal, and Picasso’s biographer, John Richardson, spoke about Tate’s friendship with both Braque and Picasso. There was just one problem. Nat Tate never existed. All those New York art experts at the party who claimed to know his work had been well and truly fooled. April Fooled, actually, and the fact that the party took place on 1 April and the subject had the names of two London galleries (Nat being short for National, and Tate) should have been a giveaway. But look again at that date, and you can almost – almost – feel sorry for the people who were hoaxed. Within a few months that kind of arty leg-pull would become a lot harder. That August, Sergey Brin and Larry Page founded Google. If the Nat Tate joke was a cultural landmark of a kind, theirs was a far bigger one. Just over a decade later, Google was dealing with a billion searches every day. And that in turn has affected the way we read. 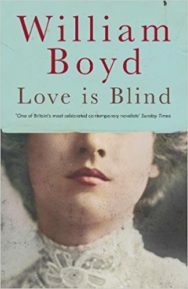 Let’s look at Boyd’s latest novel, Love is Blind, to examine this change. If he had claimed that its protagonist, Brodie Moncur was a real-life consumptive Scottish piano-tuner of genius, working for John Kilbarron, (“the Irish Liszt”), the real-life piano virtuoso to promote Scottish Channon grand pianos around Europe in the late 1890s, it would be easy enough for us all to check whether he was telling porkies. Potentially, the internet makes us the less deceived. That entirely fictitious set-up – along with Moncur’s love for Kilbarron’s mistress, Lika Blum, and an ingenious musical subplot – forms the core of the new book. But just as in his acclaimed 2002 novel Any Human Heart, Boyd drags a few famous real-life people into the mix – although this time he goes to some trouble to mask their identity. So when Moncur meets a Russian doctor on the Promenade des Anglais in Nice, we are told that he didn’t catch his name. Yet as this is 1897, and as the Russian is a doctor in his late thirties who is staying in the Pension Russe, drinking fermented mare’s milk in a bid to keep consumption at bay, and as Chekhov did all of those things too, I think we can safely say that we have Anton on deck. 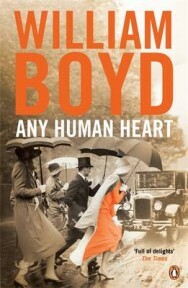 Boyd is a Chekhov obsessive, and has re-read and studied him for the last 30 years. Go to his Chelsea home and there’s a photo of Chekhov on the mantlepiece. In 2012, when I interviewed him for Waiting for Sunrise, he was working on a play about the writer that was staged in London the following year. Called Longing, it was based on a revelatory short story ‘A Visit to Friends’ which Chekhov wrote – yes, in 1897, and in Nice. Chekhov, though unnamed, appears in only half a dozen pages of Love is Blind, yet his spirit hovers over nearly all of it. Without the internet, I wouldn’t have realised how much. 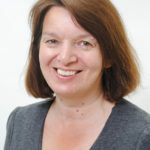 The fact that Moncur is, like Chekhov, a consumptive, is an obvious link, but there are many others, from a plot which can be seen as amplifying the closing lines of Chekhov’s short story ‘The Lady and the Dog’ to a number of other details drawn from Chekhov’s own life. I read Any Human Heart when it came out in 2002 and, like hundreds of thousands, loved it immediately. It works for two reasons. First, because it charts the inner life of Logan Mountstuart, as he bounces between careers as novelist, wartime spy, gallery owner, lecturer and impoverished pensioner, more convincingly than you would ever expect through using the (surprisingly rare) literary form of the intimate journal. Second, because of the sheer skill with which Boyd introduced real people into the narrative. No matter how implausibly exotic – Hemingway, the Duchess of Windsor – he placed them into the story as carefully as an expert fly fisherman, making sure there are no unnatural ripples on the surface. But maybe there was a third reason too – one to do with me as a reader not Boyd as a writer. Back then, I let the novel wash over me. I immersed myself in the plot without pausing to check on its plausibility. I didn’t stop to examine, for example, the real-life murder of Harry Oakes when the Duke of Windsor was governor of the Bahamas in 1943. Even if I had wanted to, in 2002 that might still might not have been possible on the internet. That year, Wikipedia had only about 100,000 articles; now it has almost six million. Maybe Harry Oakes and his demise mightn’t have made it to cyberspace. Now, with practically all of the facts in the world at my fingertips, I read differently. I read about Chekhov’s elder brothers Kolia and Alexander being alcoholics and his father being an abusive boor, and the circumstances in which Chekhov took his last drink of champagne and wonder whether that is the reason for an apparent mirroring of all these things in Love is Blind. And then there’s Lika. In the novel, Lika Blum is the love of Brodie Moncur’s life. She is the reason the book has the title it does, because when it comes to her, his love really is blind. Type “Lika” and “Chekhov” into Google and you come up with the fact that Lika Mizinova was a blonde, buxom would-be opera singer, probably the great love of his life: 19 years old when Chekhov started a ten-year affair with her that was still continuing when he was in Nice in 1897. Who is the source of all this information? None other than William Boyd, writing a piece in The Guardian on the centenary of Chekhov’s death in 2004. So we shouldn’t perhaps be too surprised that the Lika here in his new novel – also a blonde, buxom, would-be opera singer – is very like the Lika there. My point here isn’t to chart the extent of Love is Blind’s Chekhovian overlay but just to reflect on what the internet adds – and takes away from – reading fiction. Reading Boyd’s new novel has also involved me looking at YouTube videos of piano tuning (a key plot point, oddly enough) as well as realising, perhaps even more deeply than I have done before, the complexities involved in twisting the historical reality into credible fiction. I admire his craft as much as I ever have, even if the way I read – and maybe the way we all read – means I give in to it less. Love is Blind is published by Viking, priced £20.